While Hamas has rejected cease-fires proposed by Egypt and the UN, including a humanitarian cease-fire, it has continued its relentless rocket assaults and tunnel invasions, the proximate triggers for this immediate conflict. If we want to prevent further tragedies, it is important to go beyond the "fog of war" -- to go behind the daily headlines that cloud understanding and the clichés (the "cycle of violence") that corrupt it -- and ask some fundamental questions about root causes and the basis for its resolution. 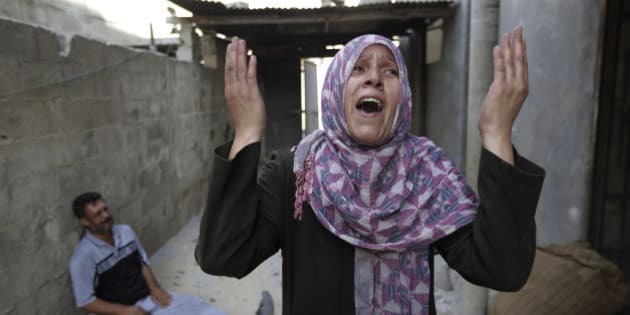 But, while Hamas has rejected cease-fires proposed by Egypt and the UN, including a humanitarian cease-fire, it has continued its relentless rocket assaults and tunnel invasions, the proximate triggers for this immediate conflict. 2. Are you aware that the Hamas charter and declarations refer to Jews as "inherently evil," as a "cancer" as responsible for all evils in the world and as defilers of Islam? 3. Are you aware that Hamas -- not only during the present hostilities, but before them -- has propagated a state-sanctioned culture of hate in the mosques, in the schools, in the broadcasting system, in the summer camps and training camps? 6. Are you aware that since Israel withdrew all its citizens, uprooted all its settlements, and completely disengaged from Gaza in 2005, Hamas has deliberately -- and indiscriminately -- launched over 11,000 rockets and missiles, terrorizing Israeli cities, towns and villages? 8. Do you agree that Israel -- like any other state -- has both the right and obligation to protect its citizens, and a right to self-defence against such armed attack as set forth in Article 51 of the UN Charter? Indeed, in a recent joint statement, the European Union's 28 foreign ministers called on Hamas to "immediately . . . renounce violence," while recognizing Israel's "legitimate right to defend itself against any attacks." 9. Do you agree that, while Israel has the right to self-defense, its exercise must comport with the principles of international humanitarian law, including the principle of proportionality and the prohibition against the infliction of unnecessary suffering? 10. Do you agree that Palestinians in Gaza have the same right as Israelis to live in peace and security? Are you aware of the domestic repression by Hamas of Palestinians in Gaza, of the use and abuse of Palestinian civilians as human shields and that Hamas has converted the civilian infrastructure to an underground terrorist city? 13. Do you agree that the cease-fire must be durable and sustainable to protect the peace and security of both Israelis and Palestinians? 14. Do you agree that a comprehensive and enduring cease-fire should include: the recognition of Israel's right to live in peace and security; the cessation of all acts of terror and violence against Israeli civilians; the demilitarization of Gaza; the dismantling of its weapons infrastructure and the disbanding of its terrorist militias; the establishment of an international protection and stabilization force to enforce the cease-fire and to protect against the rebuilding of any terrorist infrastructure; the deployment of a massive humanitarian undertaking to ensure assistance reaches those in need; the initiation of a comprehensive program for the reconstruction of Gaza and the rehabilitation of its citizens; and the freeing of Palestinian society from the cynical and oppressive culture of hate and incitement fueled by Hamas.